The Samsung Exynos Twitter account crackled to life on Thursday morning with a tweet hinting that an evolved Exynos 5 Octa is coming. 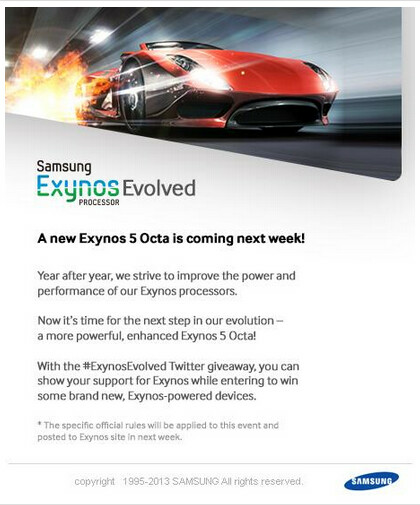 The attachment to the tweet states that a more powerful and enhanced Exynos 5 Octa will be introduced next week. Right now, the most current version of the Samsung Exynos 5 Octa is found on certain versions of the Samsung Galaxy S4. Recently, a road map from low cost chip producer MediaTek showed off a true octa-core chip coming, manufactured using TSMC's 28nm process. Mass production of this chip, the MT6592, is expected to start in November with the first handsets powered by the silicon to launch early next year. All 8 cores will be available for use at once. Turning back to the tweet about the Samsung Exynos 5 Octa, the Korean tech titan said that it will be holding a Twitter based contest based on the evolved chip and the rules will be released next week. According to Samsung, the prizes will consist of Exynos powered devices. more like 33k http://www.phonearena.com/news/Samsung-Galaxy-Note-3-benchmarked-again-at-AnTuTu_id45419 which is exactly what the S4 does on SD800http://forum.xda-developers.com/showpost.php?p=43624680&postcount=43 This is not as much about benchmarks anymore, but power/efficiency, and the first real Octa core with proper core migration could boost the Exynos battery life. Did u waste 2 just to ask this? ;) Those AnTuTu scores are for y'all homes! 33k in AnTuTu terms is what to expect I think crossover, OctaV2, SD800, Tegra 4 on a real mobile device not a reference tablet with heat sink... who will win the efficiency race however? Can Intel come and steal the show? Intel's baytrail scored over 40000 at 1.1ghz. Arm is dying soon it will be intel in all flagships. It will be AMD vs Intel all over again. Unknown circumstances though, like the Tegra 4 model, it could've been on wall with heatsinking... Intel has been struggling to match the best of the mobile SoC, but let's hope they do get it right this time, performance per watt. Intel cheated, it was modified the Antutu which helped Intel perform significantly higher. Intel lose around 20-30% results, plus 1.1Ghz but probably with a turbo boost to 2Ghz or something. first of all learn the meaning of octa core you drunk! The first real octacore chip is the mediatek one, it is only a7 so it is about equal to a quad core a15 but it uses less power. Potentially, if anything were optimized to use all of them. Guess what though? Nothing does -- so have fun with a minimum of 4 cores, mostly 6 rotting doing nothing 99% of the time. Octa-core simply means the CPU sports 8 cores, which is true to the Exynos 5410 as well. Sure, using all at the same time would have performance benefits, but 4 A7 cores don't add too much performance while 8 cores running sky high would overheat quickly. Proper core migration is the way to go, to use 2-3-4 cores in any combination at any frequency. Samsung wanted that initially, and here's hoping they got it right this time. the only reason most of anybody should be excited about this is if there's plans to use them in the next series of Notes. Excited for this but a couple things worth noting, Production issues with S4 last time. Will that happen again or can they universally make the phone with all Exynos chips? S600 looked like it actually had better battery life and held its own with the Octa. Snapdragon chips have been much more developer friendly than the Exynos ones have been. Will the Note 3 be loaded with 3GB or even 4GB of RAM with this latest Exynos then? Because if the latest rumours about the Nexus 7 II are anything to go by, it appears to have 4GB of RAM on board. MediaTek has proven that a true octa-core chip is possible, albeit older chip... But wait until the "copy king" Samsung improve on that technology with some more powerful chips. True Octa is coming soon to the Note 5 and S6. Seems like you are not much of a tech geek.. Media tek is using cortex-A7 octacore.. Have you seen the current performance of mediatek powered quad-core chips in Indian phones? They are nowhere compared to high end phones like s4 and HTC one. Like i said when Samsung get all eight cores working together like MediaTek... You're not worth further commenting too, read and comprehend before you type next time. And developer are still not amused because Samsung still doesn't release the necessary documentations for Exynos chips. Let's see with S800 and Tegra 4i.